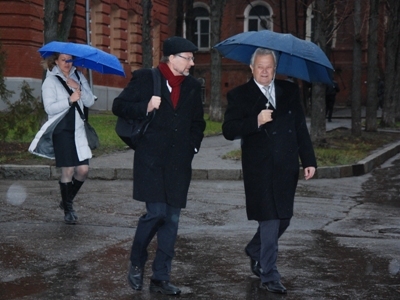 Пресс-служба | Prof. Tilmann Reuther – Honorary Doctor of NTU "KPI"
Prof. Tilmann Reuther – Honorary Doctor of NTU "KPI"
On December 3rd, 2012 there was a solemn ceremony of awarding the diploma of Honorary Doctor of NTU "KPI" to the head of department of Slavic Studies of University of Klagenfurt (Austria) Prof. Tilmann Reuther. On behalf of the administration of the University Rector of NTU "KPI" Ph.D., professor L. L. Tovazhnyanskyy thanked Professor T. Reuther for his contribution to the development of education, and also noted that thanks to him we have taken many steps towards internationalization and democratization of education, which is an essential element of development of society. He also expressed hope that fruitful cooperation will continue and gave an idea of a joint program of double diplomas of two universities - partners. This initiative was supported by the delegation of University of Klagenfurt headed by Honorary Doctor of NTU "KPI" Professor Henry Mayr. As part of the ceremony of awarding the diploma of Honorary Doctor, Professor T. Reuther invited all present to participate in his linguistic study and answer questions concerning the characteristics of the Ukrainian language. 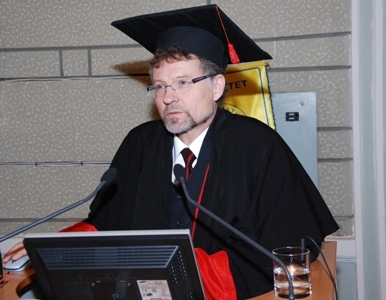 Tilmann Reuther - Professor of Russian Studies of Institute of Slavic Studies of University of Klagenfurt. His research interests include the humanities, in particular, the study of the cultural characteristics of the CIS countries, as well as linguistics and lexicology in the context of the Slavic languages. He is also actively engaged in the study of multilingualism and dialects in Ukraine. Among his scientific works – Dictionary of lexical parallels in Russian and German, which was written in conjunction with the head of the department of Ukrainian, Russian Languages ​​and Applied Linguistics of NTU "KPI" D. Ph. Sc. V. V. Dubichinskyy. For 20 years, Professor T. Reuther has been the organizer and chief coordinator of the exchange program between Austria and Ukraine, which was at one time one of the first in Ukraine. During his long cooperation with the Department of Humanities of NTU "KPI", about 700 Austrian and Ukrainian students had the opportunity to visit the country, whose language they are studying, to achieve an unforgettable experience of intercultural communication and make the language exam for a certificate.